KayCee and Ella made these marshmallow snowmen for me. Not all of the marshmallows actually made it to snowman status because they were just too yummy and they couldn’t resist them! They’re great fun to make with young children. 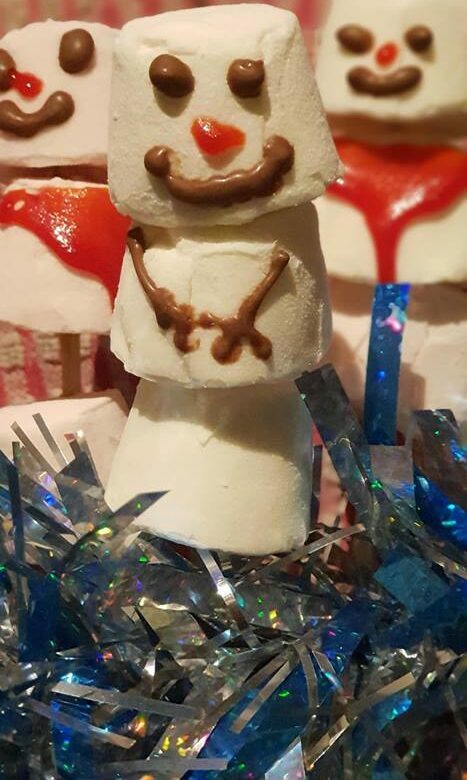 You just put 3 marshmallows on a skewer and use writing icing to draw on the snowmen’s features. We used Cake Decor Choco Writers chocolate writing icing. Ella used the red writing icing to add scarves but next time we make them we’re going to use some strawberry fruit winders instead.